Our coloured crystal is available in a choice of eight colours - amber, solid black, transparent black, blue, green, pink, purple and red. Pack of 4 coloured crystal octagons. Pack of 5 coloured crystal squares. Pack of 3 coloured crystal pears. Pack of 2 coloured crystal drops. 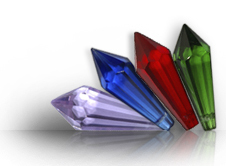 Pack of 3 coloured crystal spear points.